For other uses, see Dohuk (disambiguation). Duhok (Kurdish: دهۆک‎, Syriac: ܢܘ݂ܗܕܪܐ‎ , Arabic: دهوك‎ Dahūk) is the capital of the Duhok Governorate in Iraqi Kurdistan. The city is encircled by mountains along the Tigris river. Duhok has a growing tourist industry. Its population has increased rapidly since the 1990s, as the rural population moved to the cities after villages were destroyed by the Iraqi army. The University of Duhok, founded in 1992, is a renowned center for teaching and research. The city of Duhok is populated by Kurds and Assyrians. It also has historical churches like: Mar Odisho church in Dairy village (located in Amadiya District). Church of Mart Shmoni and the church of Sultana Mahdokht (which was established in 325 Ad) in the village of Araden. Duhok (Duhok of Dassini) means Yazidi village. Another theory is that the name comes from Taok (meaning grapevine in Kurdish) due to the fact that the region is very well known for vine trees. The Syriac name Bēṯ Nūhadrā translates to House/Land of the military leader. It refers to a small village nearby which is a district in the city due to the growth of the city during the last century. The name Nūhadrā continues to be used in reference to the city and is also a popular name among Assyrian women. Throughout history to the present time, Duhok has acquired a strategic position historically and geographically. Between the 25th and 22nd century BC, it changed hands between the Akkadians, Sumerians, Assyrians, Amorites, Gutians, Hurrians and Hattians, before becoming an integral part of Assyria from the mid 21st century BC until the dissolution of Assyria (then known as Athura/Assuristan) in the mid 7th century AD after the Arab Islamic Conquest. 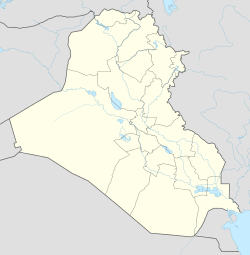 During the Assyrian period the town was named Nohadra (and also Bit Nuhadra or Naarda), where, during the Parthian-Sassanid rule in Assyria (c.160 BC to 250 AD) as Beth Nuhadra it gained semi-independence as one of a patchwork of Neo-Assyrian kingdoms in Assyria, which also included Adiabene, Osroene, Assur and Beth Garmai. During the Christian era became an eparchy within the Assyrian Church of the East metropolitanate of Ḥadyab (Erbil). The city became prominent again in 1236, when Hasan Beg Saifadin joined the Kurdish Badinan principality. In 1842, the principality was dissolved by the Ottomans and connected to the city of Mosul. In 1898 there were according to a report eleven small and private schools in the city, two Assyrian and two Jewish schools. In 1920 there were in all of Iraq only five primary schools that were accessible for girls, and one of them was in Duhok, Kurdistan. From 22 to 24 September 2005 Duhok held a cultural festival that was for the first time in Duhok to which Kurdish writers from all countries were invited. Multiple travelers commented on its ethnic composition in the 19th and early 20th century. In 1820, Rich described it as a small town of 300 houses, which was the principal site of the Doski tribe, together with eighty other villages. The missionary Henry Aaron Stern (1851) commented on Duhok's mixed population and noted that it included Jewish residents, adding that the kiahya, or mayor of the village, was a Chaldean Catholic. In 1859, Rabbi Yehiel found there two minyans of Jews. The Muslims and Christians formed about a hundred households. In 1929, its settled population was about 3,500 inhabitants, with Kurds forming the majority. Out of the 550 households, 65 were Christian and 30 were Jewish. A sizeable number of Nestorian refugees previously from Tiyari and a lesser number of Chaldeans from the Turkish districts of Merga and Bothan migrated into Duhok in the aftermath of World War I. In 1929, the qada of Duhok had a mixed population of 29,858, composed mostly of Muslim Kurds (18,307), Christians 5,784 (19.3%), Muslim Arabs 2,068, Yezidis 2,870, and Jews 829 (2.7%). The city's population is made up of around 340,000 inhabitants, and consists mostly of Kurds, with a significant Assyrian community as well. The Assyrians of Duhok boast one of the largest churches in the region named the Mar Marsi Cathedral, and is the center of an Eparchy. Tens of thousands of Yazidi and Assyrian Christian refugees live in the city as well due to the ISIS invasion of Iraq in 2014 and the subsequent Fall of Mosul and the Nineveh Plains region after 2 more months of fighting, in addition to the Siege of Sinjar in which 5,000 Yezidis were massacred in what has been referred to as a Genocide against them. The city is home to several sporting clubs including Duhok SC, a professional football club that plays in the Iraqi Premier League, its home stadium can hold up to 30,000 spectators. Another football team from the city is Zeravani SC which plays in the Kurdish Premier League. Duhok also has a range of other sport clubs, notably the Duhok Basketball Club. Duhok SC basketball competes in the Iraqi Division I Basketball League and successfully came third in FIBA Asia Champions Cup in 2012. Duhok SC football club won the Iraqi premier league championship In the 2009/2010 season beating Talaba SC 1–0 to become the champions for the first time. According to the Köppen-Geiger climate classification system, Duhok has a borderline Semi-arid (BSh) and Mediterranean climate (Csa) with extremely hot, dry summers and relatively cool, wet winters, similar to most of the region in Upper Mesopotamia. Precipitation falls in the cooler months, being the heaviest in late winter and early spring. The city can get around 2-3 snowy days per year, with heavier falls in the uplands. Summers are virtually dry, with rain starting to occur by late autumn. ^ BAHDĪNĀN. "Encyclopaedia Iranica". www.iranicaonline.org. ^ M. Zaken, Jewish Subjects and Their Tribal Chieftains in Kurdistan, 376 pp., Brill, 2007. ^ Mar Narsi church. "Dhouk". www.ishtartv.com. ^ Khalel, Sheren; Vickery, Matthew (27 October 2014). "The Forgotten Yazidis". Foreign Policy Magazine. ^ Interactive. "Iraq's exodus". www.aljazeera.com. ^ "Dahuk, Iraq Climate". My Forecast. Retrieved 2014-01-04. ^ "Climate, weather, temperatures - City : DUHOK". Levoyageur. Retrieved 2014-01-04. 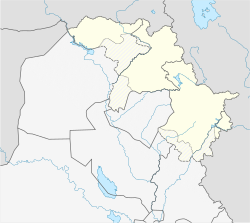 Wikimedia Commons has media related to Duhok.